In first part of concert Fiesta-Concerto Duet - Miguel Antonio, Flamenco guitarist and Vladimir Kaliazine, accordion, will present their musical transcriptions, arrangements and improvisations are masterfully combined with Flamenco, Classical and Latin American folk, composers like Juanjo Dominguez, Jose Torregrosa, Joao Pernambuco, Jorge Cardoso and Paco Pena. In the 2d part of concert will be unique jazz trio led by Victor Prieto: https://www.youtube.com/watch?v=YkNrXUweNnQ . 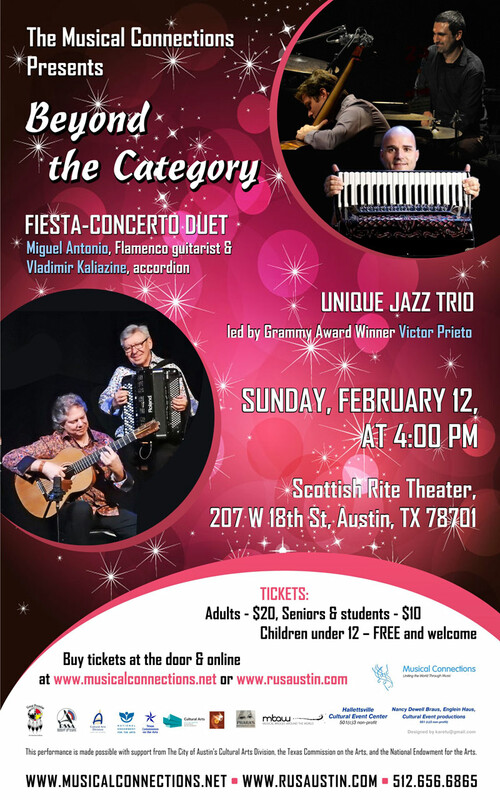 Grammy Award Winner Victor Prieto will play his original composition and contemporary Jazz. The New York Times as "A fiendishly skilled accordionist and composer", and by The All About Jazz, as “One of the best World music and Jazz accordionists now days”. 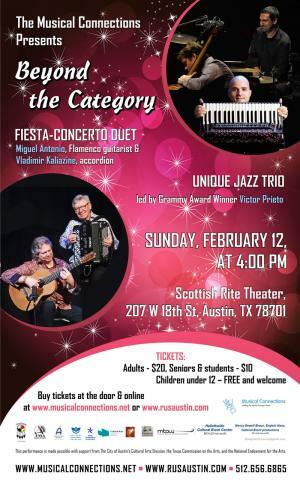 The City of Austin’s Cultural Arts Division, a grant from the Texas Commission on the Arts, an award from the National Endowment for the Arts, have all helped make this event possible. Please join us! To learn about upcoming Musical Connections shows or to obtain interviews or reviews, please contact Sergey Vashchenko at balalaika@sbcglobal.netor at (512) 656-6865.